This version doesn’t have ham in it. During my food allergy curing, gut healing exercise, I hankered for baked goods. There’s nothing quite like sinking your chompers into soft, savory goodness and I missed that satisfying sensation. I also sought an alternative gluten-free, nutrient-dense breakfast option. Enter the coconut flour muffin. 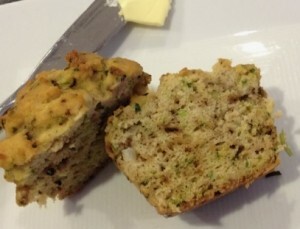 Combining insight from a few paleo recipe websites, I created a fluffy muffin that fit my tastes. My thanks to healyeatsreal.com for the inspiration. If you’re down with dairy, enjoy these slathered with grass-fed, 82% butter. Damn tasty. Bonus: they freeze well. Microwave on high for 30-40 seconds after you take one from the freezer. 2. Combine all ingredients in a large bowl except coconut oil and mix well. Melt coconut oil in microwave (30 seconds to 1 minute, depending on your wattage). Add oil to the mixture and stir until completely incorporated. 3. Place batter in lined muffin tins — the batter will be fairly stiff — not pourable. (I use these silicone baking cups). 4. Bake 25- 30 minutes or until a toothpick inserted comes out clean and tops are slightly brown. 5. Enjoy with abandon and feel free to experiment with other ingredients — the recipe is flexible and forgiving.